The subject property is a very matured durian plantation. Most of the durian trees are perhaps 20 over years and the environment is shady and cooling. 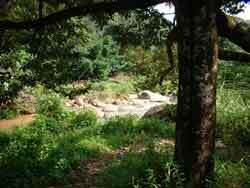 A nice view of the river from under a mature and healthy durian tree. What a nice place to rest after a week of hardwork in the city. A closer view of the river which is crystal clear. 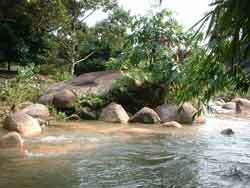 Due to the soothing sound of the river and the shady durian trees, the whole environment seems cooling and refreshing.